You likely recall the flexo printing evolution through the years in response to pressures from economy and demand. As industries produced more, they required more packaging (of different varieties). And as they’ve required more packaging, they’ve required higher-quality printing to identify and promote their products. The result? Direct laser engraving (DLE) elastomer sleeves. Despite some lag time being adopted in the North American flexographic market, DLE has emerged in response to the prevalence of in-the-round (ITR) elastomer sleeves. They’re produced by removing non-printing areas through laser ablation. Washing down photopolymer usually involves solvents that can be harmful to users and the environment if not disposed of correctly. Elastomer blends don’t require such solvents, and in most cases are cleaned up with a water- and soap-based cleaning detergent after the laser-ablation process. 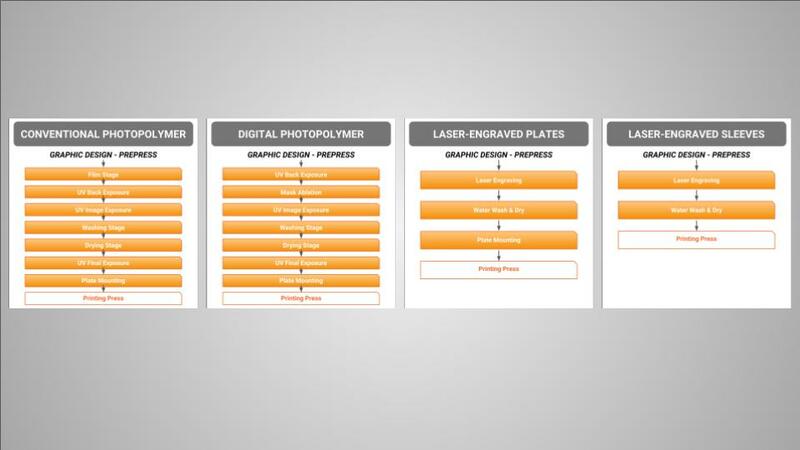 For decades, flat photopolymer plates dominated the flexo market in North America. But in some applications, flat plates yield costly quality control issues like press misregistration. ITR sleeves have become the solution for a seamless, continuous print. There are far fewer steps required to make an ITR elastomer sleeve press ready, as compared to conventional photopolymer plates, digital photopolymer plates, and simple laser-engraved plates. Fewer steps mean fewer chances for error. Elastomer sleeves’ thickness and durability allow them to print continuously 2 to 4 times longer than photopolymer plates. You won’t need to buy or make multiple plates for long jobs or repeated short jobs, which typically require multiple cleanings and remountings. Additionally, the process requires no extra labor and mounting materials. “Load-N-Lok” and you’re good to go. Misregistration is one of the most common flexographic printing defects encountered in the industry. Quite often, it’s a problem of misalignment. But it also could stem from press mechanics or plate lift. Sleeves can be notched to align with each other as they’re engraved to achieve optimal registration. Laser-engraved sleeves manufactured in-the-round don’t experience plate lift. You’ll also have fewer issues with cylinder bounce or uniformity. What’s more, elastomer sleeves are resistant to harsh chemicals and abrasion, meaning there’s very little chance for image skewing from wear over time. Without registration issues and vulnerability to wear and tear, DLE elastomer sleeves don’t create much wasted substrate. There’s simply no need to waste ink printing costly lengths of substrate, making adjustments, and test more to get the quality you need. Relatedly, this can also streamline your printing operation and limit labor costs. Your employees should be able to finish projects more quickly and move on to other tasks. The success of your flexo printing operation hinges upon quality and efficiency. Now, with direct laser-engraving technology and ITR elastomer, you can achieve high-definition prints in a fraction of the time. With a great cleaning and maintenance regimen, your flexo sleeve investment could last a very long time. Let’s work toward printing perfection. Can we help? Call (888) 545-2270.